To me, Pixar’s latest movie is just as many of its predecessors: nice, but nothing I would kill for or would watch ten times. I had this feeling after watching Nemo. I also had this feeling for Toy Story. Basically I had this feeling for any Pixar movie except for Incredibles and Wall-E. Ratatoullie is on the fence. 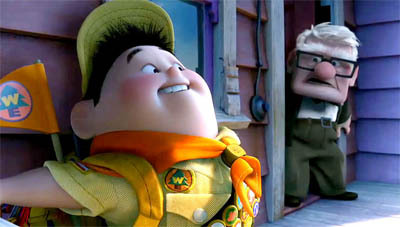 Don’t get me wrong, Pixar’s Up is a good if not very good movie. Yet, there are way too many problems and missteps in the script to call Up a masterpiece. If one word reviews were part of this blog (which is an interesting idea) I’d write that Up was “Rushed!” right from the beginning. Where Wall-E took its time to establish the main character and its quirks, Up presents us almost the whole life of Carl in some mere minutes and even then doesn’t stand still. On the contrary it continues to rush throughout its story. 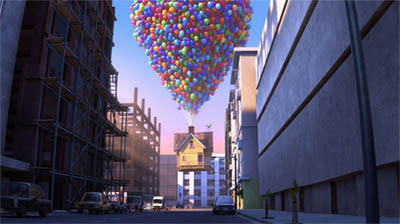 One missed opportunity of epic proportions was the start of Carl’s house into the heavens. I don’t know how others feel about it but this could have been one of the most poetic moments in the history of cinema. It could have shown an old grumpy man who awakes a city without drive, filled by people without dreams but with business. It could have become the explosion of creativity in a world of grays (think of Incredibles which shares a similar first act). It’s a real shame they didn’t or couldn’t go for it (see above: Rushed!) but instead went with something that felt like “been there done that”. The same goes for the journey itself which way too short (again: Ruuuushed!!). It lacks any weight and seems to be just a filler to show us that they indeed managed to get to the south. There is no conversation between the two characters; we learn nothing of importance of Russell except for his hobby. And just as the sequence started it stopped: they reach their goal not only almost spot on but with a speed that matches any airplane. After that the movie slows down drastically. Whereas the journey took some seconds to finish, the last thousand or so steps seemingly take forever in comparison which is important since this plays into the subplot of the bird catching. Another major letdown to me here were the dogs. You know, Up did its best to establish a world we eerily feel familiar with. We see lawyers, courts and even blood for the first time ever in a Pixar movie. The message was clear: this is no fantasy or alternate reality as in Incredibles. This is real life with all its hardships. But then we suddenly get to see not only talking dogs thanks to some magic technology, but talking dogs that serve food and even cook it. To me, it felt as if two screenwriters were ordered to work on the same script separately. And they again missed a big opportunity here: with Charles Muntz they could have introduced a character who not wants to redeem his name (as shown in the movie) but instead – as Charles – could have wanted to fulfill his biggest dream. Hence, both old men could have been presented as two sides of the same thing: one couldn’t fulfill his dreams but had a (wonderful) life; the other one tried to fulfill his dreams but ruined his life along the way. And right in the middle the young boy Russell. At least to me this would have made far more sense and would have resulted in a much more focused storytelling. Those points I mentioned above don’t make this movie bad, far from it. I still like the experience and the overall good storytelling compared to the other 3d animated movies published by Hollywood. 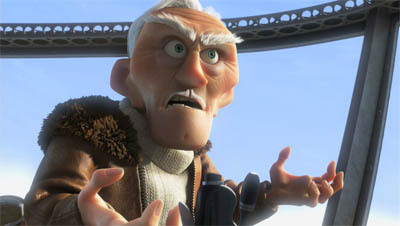 In that regard Pixar still owns the game because they really try to tell new, creative stories. It’s just a fact that you cannot win every time. Sometimes you even fall into a trap as happened with those nasty talking dogs. As if Pixar needed this horrid cliché of talking animals everyone else uses. The movie is nice, something you really can watch and will have fun since the jokes are almost perfect again. The only thing that nags me constantly is the fact that this movie was hyped beyond the skies. Was it really a simple hype that occurs every time someone pulls out something better than average or am I really wrong here with my remarks? 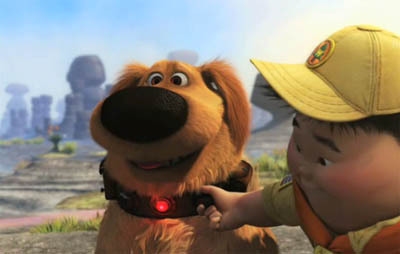 Am I wrong with not liking Pixar’s Up that much? What do you think? Besides Cars on of Pixar's biggest blunders. I completely agree. I was starting to feel like the only person in the country who didn’t like Up! I did love the opening montage of his married life. It was extremely touching and heartfelt. But after it’s done, the movie goes down-hill. The script was not only poor, but it was empty. And I completely agree about the absurdity of the talking dogs. People only liked the movie because of the begining. I feel that this article is uncalled-for criticism of a great movie. 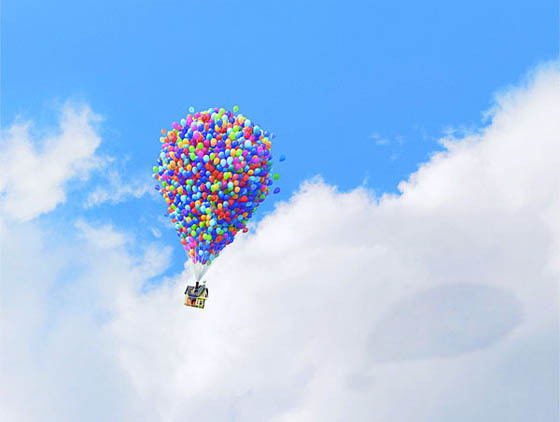 Up is not about being realistic in its story; Up is about the feelings. The joys mixed with sadness and humor combine into something that is more than a movie, it’s an understanding of how life should be lived. Up is not about the geographical journey that is taking place, it is about the emotional journey of Mr. Fredrickson and the Small Mailman. The point of talking dogs is not to be realistic, but to add charcters with a humorous spin. This article on Up’s faults kind of misses the point. Here’s a follow up post to James’ comment in the usual madmind way of bashing. Don’t take the title or other stuff personally, please! Kaia, first thanks for commenting and second, you are a genius because you gave me the ultimate idea of why Up feels so uneven to me: the first act more or less is anything but a kids movie while the rest in many ways is. So, partly I agree with you. On the other hand: what is a kids movie? When I think about it it’s kinda hard to define (and a cool idea for a post so I postpone this discussion for the moment but thanks for that idea). Hey this movie wasnt the “best” but my son loves it, he quoats the scenes and actually had me for a good 30min into the story, I was just wondering why the old man was so evil? why the boys mom wasnt all freaked out by this man and how the hell Carl didnt break a hip…lol all in all its at least a 2/3 movie. I am agree about your points. quite right! by the way, do you know where i can get the script of this movie on line? send me the website…thanks a lot…. Google. Google is the way to go. Or try the International Movie Script Database. Because I don’t know the URL anymore, enter the site name in Google. As you can see, it always starts with Google.